Young Living Essential Oils started small in 1993. Even before that Gary Young, the owner, had been collecting seeds, creating farms, and discovering the power of pure essential oils. Today, Young Living has grown to become the world leader in essential oils and wellness solutions. Through research and discovery Young Living found that geographic location, soil type, climate, and many other elements determine the health and growth of plants and thus the quality of the essential oil. Poor farming practices produce low quality and unhealthy plants that in turn produce substandard oils for therapeutic use. These oils are often restructured with synthetic compounds to look like a pure oil. So, whether using a topical, dietary, or aromatic application artificial compounds are entering the body. With Young Living you never have to worry about this. Young Living Essential Oils are pure! Plants grow best in their natural environment and Young Living has taken advantage of this with a variety of global farms. By cultivating, harvesting, and distilling many essential oils on Young Living farms, we have the unique ability to verify perfection at every step of the process. 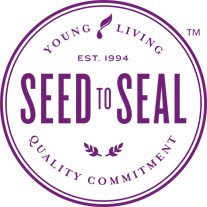 Seed to Seal is a 5 step process created by Young Living. From the time the seed is sourced until the oil is sealed in the bottle, we apply the most rigorous quality controls possible to ensure that you are receiving essential oils exactly the way nature intended.